Most apples have white or nearly-white flesh, but a small number of varieties have pink or even deep red flesh. The gene for red-fleshed apples seems to have come from a crab apple, and many of these varieties have crab-apple characteristics, including relatively poor flavour. Almata is an exception, in that the flavour is reasonably good (although certainly not outstanding). The apples are small, round-conical, about two inches in diameter. The stalk is of medium length, fairly thick, in a shallow cavity, projecting beyond the base. The skin is wholly red and smooth, with a greyish bloom. The flesh is deep pink, soft, and tender; the juice is sweet and tart. The eye is closed and there is little or no cavity. The appearance is very similar to Scarlet Surprise (also American) and Huonville Crab (Australian). There are apples in most years, though there is a slight tendency to be biennial. 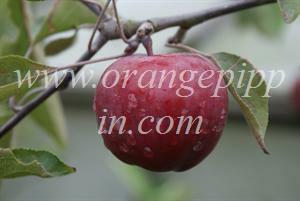 This apple is more acidic than typical dessert varieties, having an intense sharp brisk flavour. It keeps in good condition for about a week. After this time it is sweeter and less acidic. The flesh texture is not as crisp as Scarlet Surprise. In sunny years when fully ripe it can be sweet on the day of picking. The tree is slender and partial tip-bearing. The blossom is wholly red, new leaves are bronze-coloured, and the wood is pigmented red. The flowering period is early; about 14 days earlier than Bramley. It is an effective pollinator. The tree grows quite vigorously and there is no susceptibility to woolly aphis or mildew. We are grateful to Nigel Deacon, an English apple enthusiast with a particular interest in red-fleshed apple varieties, for samples and background of this apple variety. There are details of many more red-fleshed apples on his website and he can supply / exchange seeds and scionwood - see Diversity website. I have three apple trees. They only produce everyother year.they are a red apple when fully ripe with a yellowish white center.good for applesauce,jelly,juice,pie ect. All I have been told is that they are a winter apple. They kinda look like the Almata to me but not sure.these trees are over 100 years old.I put out a free apple sign and people come from all over to pick them.. It seems like they have a blast.and so do the deer. I have two of these, they ripen in late July / early August. I find the taste rather remarkable, its tart, makes great pies, dried apples, etc. I get a decent crop every year, not something I can say for all the other varieties I gro.